Diesel prices today stand at Rs. 68.07 per litre in Delhi. Diesel price in Mumbai is Rs. 72.23 per litre. Diesel price in Kolkata is Rs. 70.62 per litre. In Chennai, it is Rs. 71.85 per litre. The new listed rates are applicable from 6:00 am on July 9, 2018. State-run oil marketing companies Indian Oil, Bharat Petroleum and Hindustan Petroleum revise fuel prices with effect from 6 am every day. This rise comes after prices started to decline on May 30. Also, both the petrol and diesel prices were unchanged for nine days till July 4. 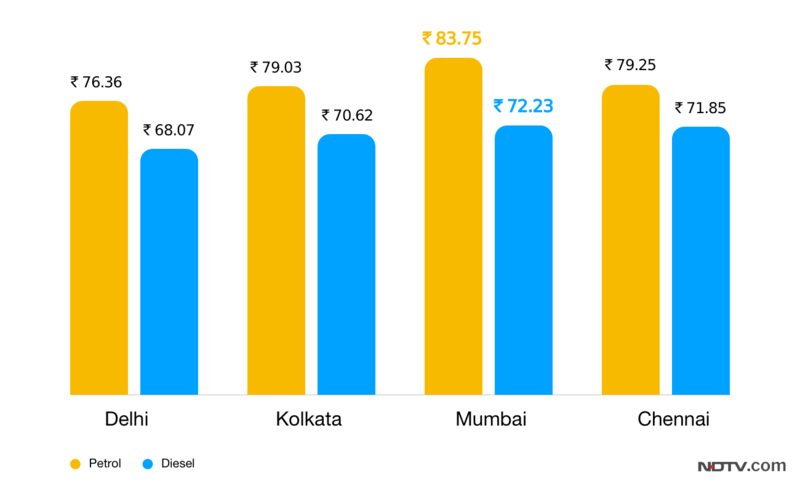 Petrol prices in Delhi are the lowest among all metro cities due to lower sales tax or VAT (Value-Added Tax). Fuel prices in the country are largely determined by oil marketing companies according to global crude oil rates, the rupee-dollar exchange rate, among other factors. While the Organisation of Petroleum Exporting Countries’ (OPEC) decision last month to raise production by nearly 1 million barrels per day led to a softening of international rates, the threat of sanctions on Iran after the US withdrawal from the nuclear deal with the Gulf nation, is again pushing prices. According to oil marketing company officials, the US is putting pressure on importers of Iranian oil like India and China to end all imports by November 4, reported IANS. During the previous UPA regime, diesel prices hit a peak on May 13, 2014, when rates touched Rs. 56.71 a litre, a Press Trust of India (PTI) report said. The government had deregulated or freed petrol pricing from its control in June 2010 and diesel in October 2014. It allowed revision of prices on a daily basis since mid-June last year to reflect changes in cost instantly.